Protesters hold signs during a rally outside the River Bluff Dental clinic against the killing of a famous lion in Zimbabwe, in Bloomington, Minnesota, July 29, 2015. Officials in Zimbabwe are seeking the extradition of an American who is accused of killing a well-known lion who lived on a wildlife reserve. Zimbabwe Friday called for the extradition of Walter Palmer, a dentist who lives in Eden Prairie, Minnesota. Zimbabwe's environment, water and climate minister, Oppah Muchinguri, said Harare was hopeful the Obama administration would cooperate in efforts to extradite Palmer to face charges of illegally killing the lion. "Already the processes have started and we are looking forward to his extradition. There is much outcry; I am very happy that almost 500,000 people are calling for his extradition (on Facebook). We need that support," Muchinguri said. "We are taking this issue seriously. We want him [Palmer] tried in the (United) States and extradited to Zimbabwe and be tried for the crime that he committed," she said. Palmer has gone into hiding after allegations he killed Cecil the lion during a big-game hunt in Zimbabwe earlier this month. 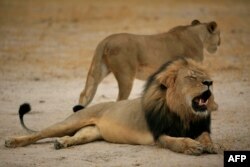 Cecil was known to be friendly to humans, and was a tourist draw at Zimbabwe's Hwange National Park. He was also part of a study by researchers at Oxford University in Britain. The trial of Theodro Bronkhorst, a Zimbabwean professional hunter who accompanied Palmer on the hunt, begins Wednesday in Hwange, a town about 700 kilometers southwest of Harare. Zimbabwean police said Bronkhorst and another man, Honest Ndlovu, accepted $50,000 to help Palmer kill the beloved 13-year-old lion. 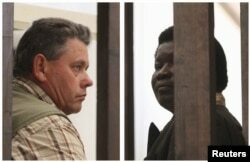 A combination photo shows Zimbabwean safari operator Honest Ndlovu, right, and fellow countryman and hunter Theo Bronkhorst waiting to appear in Hwange magistrates court, July 29, 2015. Bronkhorst is facing criminal charges for killing Cecil the lion, who was drawn away from Huange National Park in Zimbabwe and initially shot by Palmer with a bow and arrow, before he and Bronkhorst tracked down the lion and shot it dead with a gun. Meanwhile, conservationists said Harare has to address the issue of poverty, which forces some people to resort to poaching. Johnny Rodrigues, the head of the Zimbabwe Conservation Task Force, said arresting and prosecuting poachers will not help much to fight poaching in Zimbabwe. “The people that live surrounding the wildlife do not get any benefits. The only people that do (benefit) is the lessee of the land and the safari outfit. There is nothing that goes to the communities," Rodrigues said. "The communities should become party shareholders so that they can actually create employment. The cake is big enough," he said. That way, Rodrigues said, Zimbabweans would have a legal source of income, and would not be tempted to cooperate with foreigners who are interesting in killing the country's wildlife. Meanwhile, the U.S. Fish and Wildlife service said Thursday it has opened a probe into the killing but has been unsuccessful in reaching Palmer. The agency urged Palmer or his representative to contact U.S. officials immediately. ​The White House also said it will review a public petition to extradite Palmer to Zimbabwe. Spokesman Josh Earnest said on Thursday the petition has exceeded the required 100,000 signatures. He noted it will be up to the Justice Department to respond to an extradition request. "Sounds as though this particular petition has reached [the required] threshold, and so there will be a forthcoming White House response," Earnest said. The Safari Club International, an international hunting organization that Palmer belonged to, said it supports a probe into the killing and has suspended the memberships of Palmer and guide Bronkhorst. Palmer has said he believes the hunt was legal. He told the Minneapolis Star Tribune earlier this week that he “had no idea the lion I took was a known, local favorite” and that he may have been misled by hunting guides. This is not the first time Palmer has been in trouble for hunting. According to U.S. court records, he pleaded guilty to making false statements to the U.S. Fish and Wildlife Service about a black bear he fatally shot in Wisconsin in 2006.